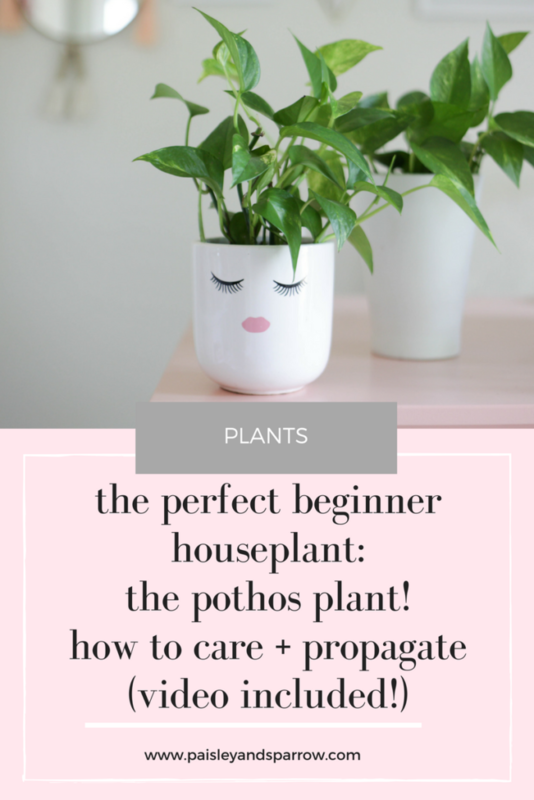 When it comes to pothos plant care, they’re easy to grow, very easy to propagate and provide a lot of green! If you’re new to plants, pothos plants (or Epipremnum aureum if you want to get technical) are the perfect starter plants. In fact, they were the very first plant I ever owned! My mom gave me one when I was in college and if a college student can master pothos plant care, so can you. 😉 That one plant has been propagated into many, many, many other plants for myself as well as numerous friends and family members. It’s no secret I love pothos plants. I have them all over my house and have even used them for tablescapes! If you follow me over on Instagram, you’ve seen lots of tips and tricks on my stories but I wanted to create a spot for you to reference back to so you can add some pothos into your life! 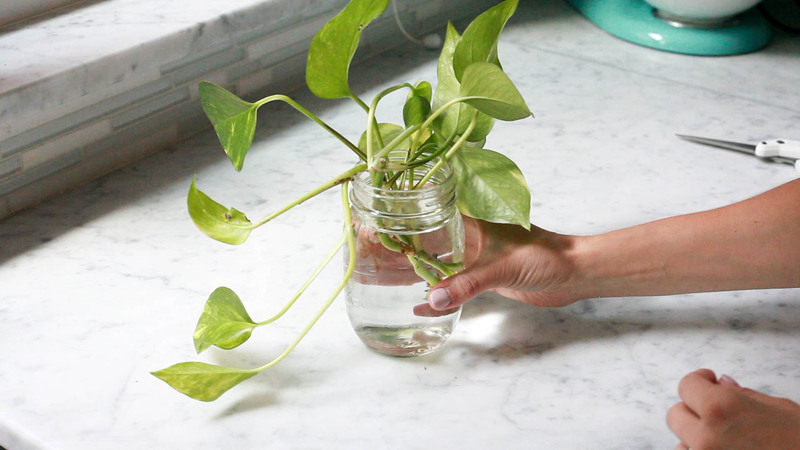 How Often Do You Water a Pothos Plant? When it comes to watering, they can survive if you forget to water them (although watering them once a week is the best!). If your plant is looking droopy or the leaves are turning brown it means it needs more water. If the leaves are yellowing or getting soft, you’re watering them too much. How Much Light Does My Pothos Plant Need? Pothos plants can live in a variety of lighting situations including low light places! Ideally they like moderate indoor light. They’re even tolerant of fluorescent lights which is why I always brought a pothos to work when I worked outside the home! Tip: if your plants are typically in low to no light, gather them up before heading out for a weekend and place them near a window (but try not to place them in a full day of direct light). Find even more low light plants here! Some people love long stems that can hang over a plant stand or down a wall. You might love short perky stems. You can do both! 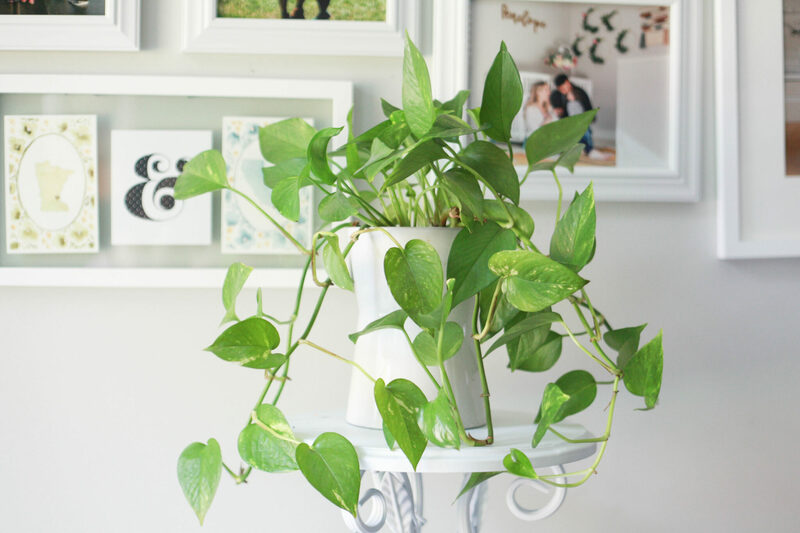 Short, perky pothos plants simply need more frequent propagating or trimming. Longer plants just need some time to grow. I have a mix of both in my home! Regardless of how you like them, trimming up extra long stems or stems that are getting a little bare is important. How Do I Propagate a Pothos Plant? What do you need? 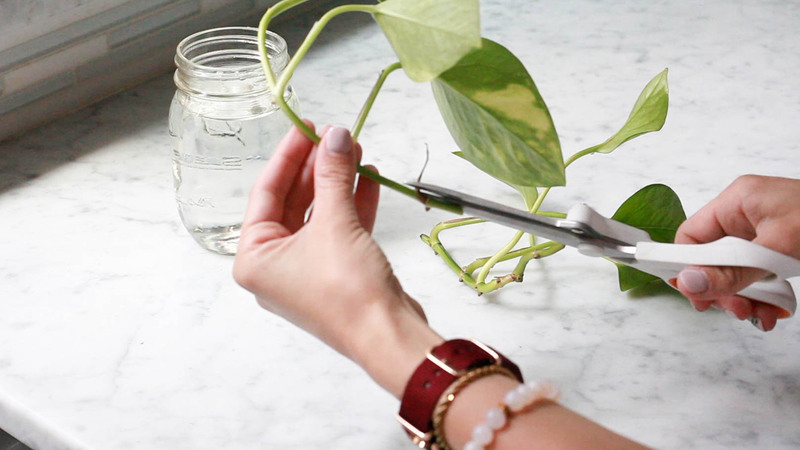 A pothos plant (duh), a pair of scissors and a jar or glass with water. 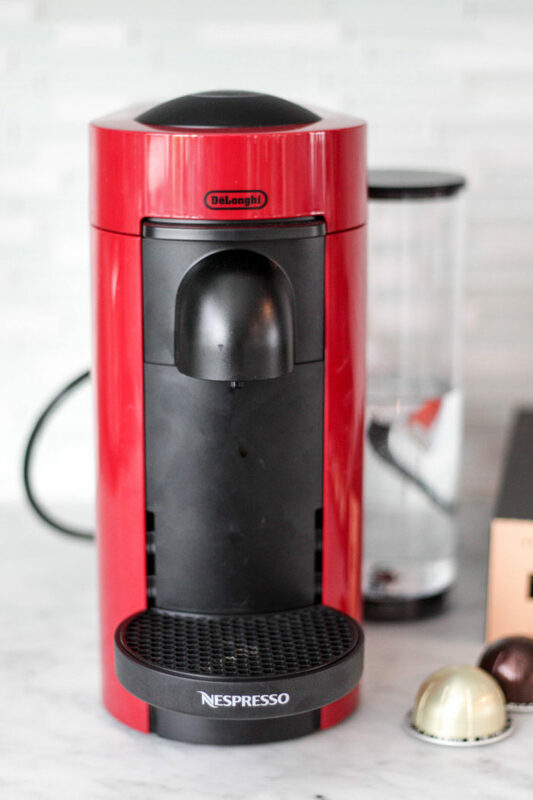 Check out the video below for all the steps, or keep reading for more. First snip of about 6 inches of stem. Make the cut right below the root nodes, or the small bumps on the stem. This is where the root will shoot out from. I typically like to cut the stem so there are 3-4 leaves attached. The roots will shoot out from the bottom so that is what will be in the soil. You don’t want to plant a leaf in the soil! Simply cut the leaf with a scissor. Next, fill up your jar with water. Fill it to the top with lukewarm water. 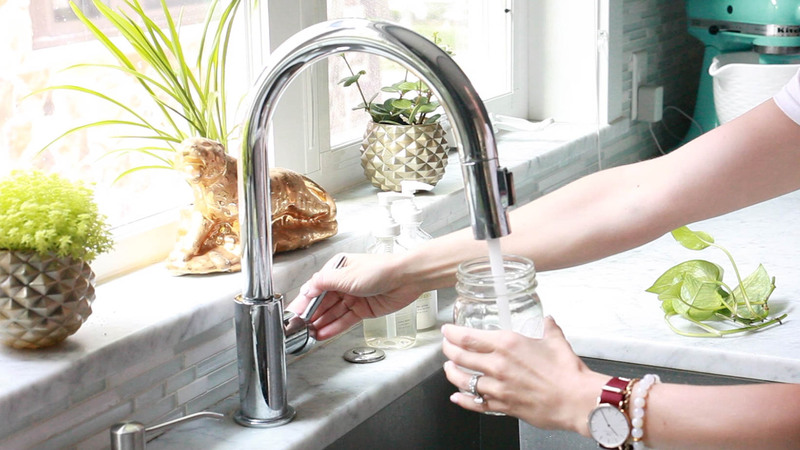 Put your cuttings in the water. Submerse the nodes (little bumps) in water. This will help roots to grow! Roots will typically grow faster if the jar has some sunlight. In all honesty I put these in our bathroom which get no light and they grow roots just fine. When roots have formed (I usually wait until they’re about an inch or so long) you can plant them! Simply put the cuttings in a pot, add dirt so the roots are fully covered, water and enjoy! 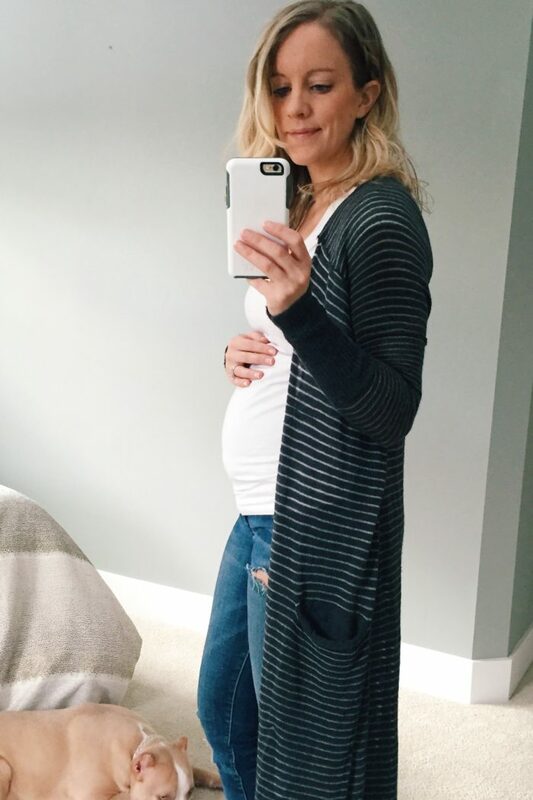 Soon enough you’ll be the favorite friend of your friend group when you show up to house warming parties, birthdays or even meeting a new baby (I think all babies need a plant in their nursery!) with a lovely pothos plant (that only cost you amount of a pot and some soil). So head to your local greenhouse, the Sill or even Amazon and get started on your very own pothos! 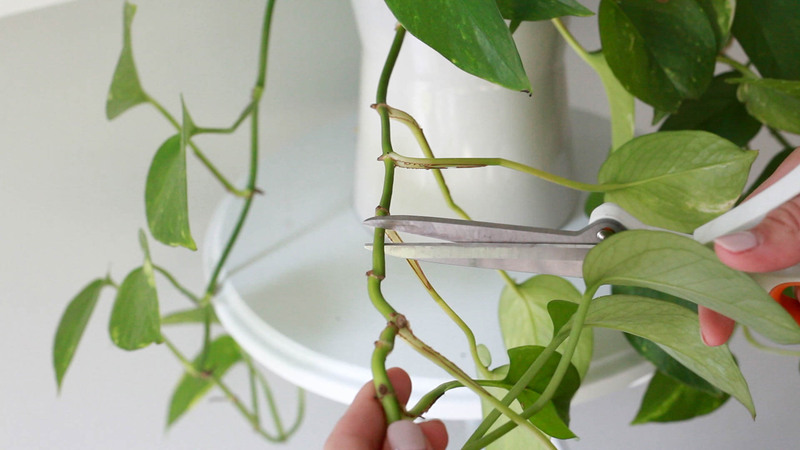 Be sure to reference this post for all your pothos plant care tips and tricks. I hope it helped! If you want even more plant tips, check out my Spider Plant – How to Grow, Care + Propagate post!